Veteran football coach and community pillar Paul Knox is expected to be replaced as head coach by Junior Varsity coach Irv Davis, the Sentinel has learned. Knox was not even afforded the luxury of informing his players first hand because the Los Angeles Times had posted the article the evening before against his wishes. Knox had called his coaches for an emergency staff meeting on Dec. 2, but did not inform the team until Dec. 3, but many had already read the published newspaper report. 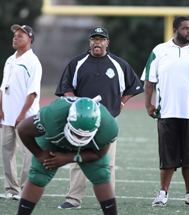 Knox, who was instrumental in producing scores of collegiate and NFL players had won four City Championships at Dorsey since 1985. He did not answer his phone and his voice mailbox was full when contacted about his termination as football coach. Knox reportedly learned of his fate from principal Dr. Reginald Sample on Dec. 2. After taking over the program in 1985, he produced players such as Keyshawn Johnson, Johnathan Franklin, Rahim Moore, the late Chris Mims and Stafon Johnson, all of whom reached the NFL. Keyshawn has frequently provided the team with footwear and equipment and Stafon recently returned to his alma mater and was serving as running backs coach and offensive coordinator during the final weeks of the season. The decision was shocking and swift, but there had been rumblings among alumni and parents of players about the direction or lack thereof regarding the program. Dorsey finished the season with a modest 6-6 record, getting pummeled by Crenshaw again and then Narbonne in the City Division-1 semi finals, which ultimately was his final game. He had retired as a teacher from the school within the past two years and was essentially a walk on coach. Davis is a former Knox player and has excelled as lower level coach at the school for the past decade. His teams frequently defeat rival Crenshaw, but whether or not he is long-term answer as head varsity coach remains to be seen. However, his status as an on campus employee is a plus and he is expected to receive the support of the players and alumni. Davis will retain that Stafon as offensive coordinator and the majority of the coaching staff. Dorsey will have to improve on its inadequate practice facilities and football budget to compete and keep players from leaving the area. The team didn’t have head phones until the last two weeks of the season according to sources.